Total War developers Creative Assembly have put out a new gameplay video of forthcoming fantasy sequel Total War: Warhammer II. 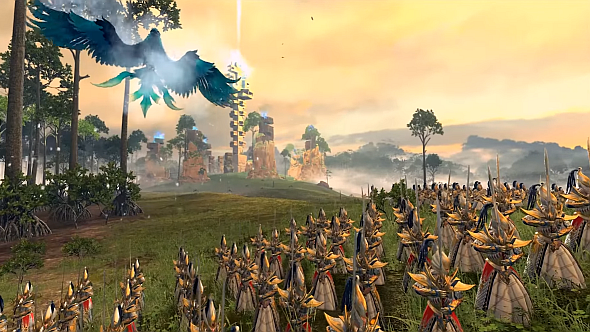 In a battle for the Mosquito Swamps – one of many sacred sites you’ll be scrapping over – we get our closest look yet at the High Elves, with some exotic new units on show. Here’s everything we know about Total War: Warhammer II. And Prince Tyrion, one of the elves’ two legendary lords. The High Elves aren’t the only ones with some new tricks on show – the Lizardmen have brought chameleon skinks and Horned One cavalry, and their legendary lord Mazdamundi is finally riding his ancient stegadon, Zlaaq, as he should be. He also casts the Ruination of Cities, which tabletop players will recognise as his iconic spell. It’s an exciting battle in which camera angles are used to great effect to showcase all the flashy fantasy units. Speaking of,here’s the High Elves’ full army roster. Total War: Warhammer II launches on September 28.